Christina Hammock Koch is getting ready for her first trip to space. 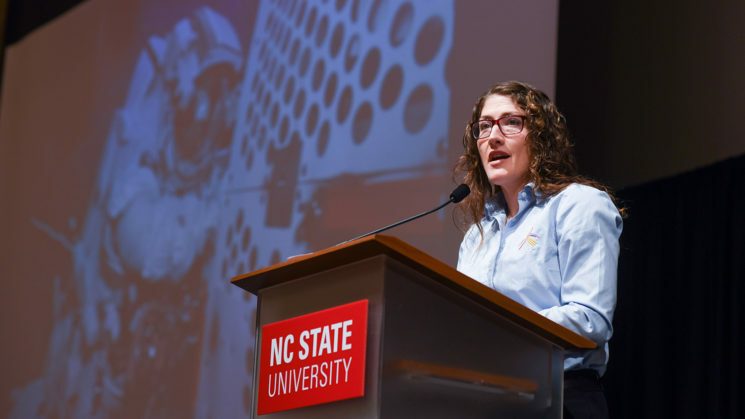 The NC State alumna and NASA astronaut will serve as a flight engineer on a mission set to launch to the International Space Station in April 2019. Koch earned bachelor’s degrees from NC State in physics and electrical engineering in 2001 and a master’s degree in electrical engineering in 2002. Since leaving campus, she has enjoyed a rich and varied science and engineering career, including developing space-science instruments at Johns Hopkins University and NASA’s Goddard Space Flight Center; serving on firefighting, search-and-rescue and scientific teams in Antarctica; conducting scientific fieldwork during multiple winters in Greenland; and serving as station chief of the American Samoa Observatory. In 2013, Koch was selected as one of eight members of the 21st NASA astronaut class. Her training included scientific and technical briefings, flight training, and intensive instruction in International Space Station systems. She completed astronaut candidate training in 2015 and is currently assigned to the International Space Station Crew Operations Branch. In this position, she is involved in crew conferences and IT-related issues on board the station. Koch has remained engaged with her alma mater even in the midst of a busy NASA career. She received the College of Sciences 2016 Distinguished Alumnus Award and spoke at the college’s 2016 Women in STEM Dinner and the Department of Physics’ 100th anniversary celebration in 2017.